Started as a chest surgery unit of the Department of General Surgery, the department had its origins on 19th august, 1959. The first Head, Prof. A. Charan, pioneered and institutionalized the practice of Thoracic and Vascular surgery and also ordained the chair of the President of the Association of Thoracic and Cardiovascular Surgery of India. In 1998 it transformed into full fledged independent department. For the first time in Uttar Pradesh, Off Pump CABG and Thoracotomy CABG were performed here in 2002 by Prof. S. K. Singh. 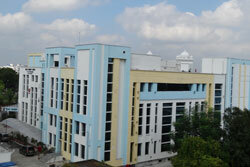 The department of CTVS was shifted to its new building on 1st March, 2011. Today the department stands proud as a four storied complex. It has state of the art facilities for doing all types of adult and pediatric cardiac surgeries, vascular and thoracic surgeries. There are three fully equipped modular operating theatres, one of them dedicated to hybrid / robotic surgeries. This is supported by twenty bedded fully equipped Intensive Care Unit with central air/ oxygen supply, 24 hours power back up, invasive monitors, ventilators, IABP, TEE, Cell Saver, ABG, Biochemical investigations, etc. There is an in-house hemodialysis facility as well as all investigative & sterilization facilities in the department premises. The department has a 150 seated seminar/ conference hall with direct electronic high definition audio-visual transmission facility from the operating rooms to the hall. The Department of CVTS-'Heart Surgery Centre', KGMU, Lucknow has come to the forefront in providing cost effective and quality cardiac surgery to the masses. The department of CTVS, KGMU, Lucknow has hosted two conferences in the past two years. Several procedures were started for the first time in Uttar Pradesh in this Department viz: cardiac pacemaker implantation (1970), open heart surgery (1981), on pump coronary artery bypass graft (CABG) operation (1982), flexible bronchoscopy (1982). heart valve replacement (1983) and video assisted thoracoscopic surgery (1997), off pump CABG including thoracotomy CABG (2002). TO START CARDIAC TRANSPLANT SURGERIES IN THE VERY NEAR FUTURE. The department is all geared up with basic infrastructure and facilities to begin with Heart Transplant Surgery in Uttar Pradesh. The department is underway with starting such a program in view of requests from cardiac surgery students from all over the world.